Well, it is August 1st somewhere in the world by now, so the Self Propelled Indirect Fire campaign has officially begun! Welcome to the official Campaign thread. She's going to be a challenge. I may do a build blog on this once I get some inertia going on it. Will post my choices too..
Vance, you should probably write to Mark Millard to get the tread sticky. He cannot monitor all treads, so it is possible he will not see your request in your post. It has been difficult to find pictures of this one in service. I finally decided to do a Syrian example from the 1973 war. It would go well in a diorama with a Syrian PT-76 I have build earlier. Especially since I am also building figures in this diorama in the "Desert" campaign at Historicus forum. I will get started this evening - more to follow soon. I have started assembly this morning, lots of warping problems with the body, let's see how it turns out. Pictures will follow. Let me be the first to post some progress in the campaign. 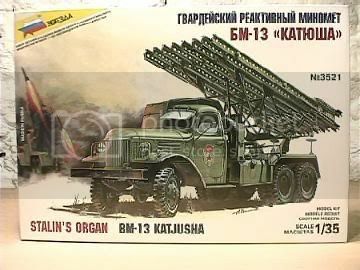 I have started my BM-13 Katusha. It is an excellent kit despite its age. The fit of the parts so far has been excellent and test dry fit of the main parts to the chassis indicates no problems. The launch rails fit perfectly and "square up" with no problems giving a perfectly flat launch frame. 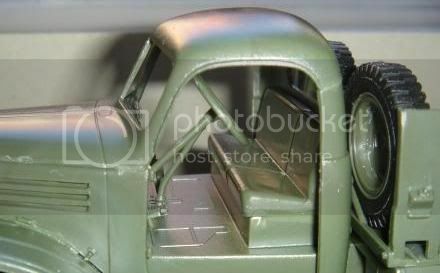 The chassis is very well detailed. Unfortunently most of it will be completely hidden when the truck is finished. Tempting to show the truck turned over on its side or similar in a diorama. The only thing in the kit that is way below standard is the figures. They are bland and featureless - not even good enough for the spares box. Basic construction is now finished. This kit is really good. The only problem is the rockets which are not easy to get perfectly round. Like assembling 16 short tank barrels. Not that easy. The stearing wheel looks like it is sitting too high in the cabin, but it might have been that way to allow a fully equipped soldier enter and exit the cabin easily. I can recommend it if one is on for a the special version of the BM-13 launcher, which leaves one without the possibility of making a WWII vehicle. I plan to give it a basecoat this evening so it is ready for camouflage Sunday. So here we have Italeri’s original M109A2 kit, no.239 from about twenty years ago. Lord knows whether it will ever reappear, with the M109A6 having replaced it on the shelves. 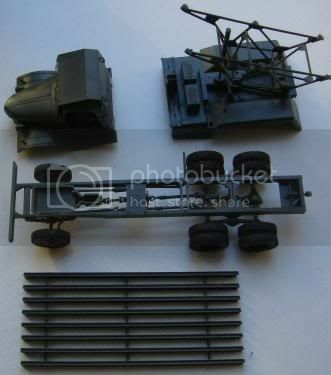 This will be from the box, as far as possible, so long as you count in an AFV Club box for the tracks. First, know your enemy: the parts laid out ready to go. A remarkably economical kit, considering how well it should look once it’s finished. The black sprue in the top left corner is one of the six that will eventually make up the tracks. Not bad for a day and a bit’s work! Most of the hull is together, the wheels are paired up, and the basic turret structure is assembled. Little bit of filler here and there but it’s not major. I have never worked this quickly. And it won’t last. The close-up of the gun shows one of the few small alterations I’ve added. The kit’s bore evacuator is very plain, but all the photos show prominent notches on the forward end. After a bit of head-scratching I worked out that they’re the expulsion vents for the evacuator, with a bracket over each one, making it look like two. So, a quick whizz with the edge of the file, a couple of bits of foil, et voila. Hopefully it will look a little more convincing with some paint on it. I’m leaving the seams because the real thing has prominent seams. The gun is fixed. It wasn’t, but fitting it to the turret was trickier than I expected, and some of the glue … strayed. Ah well, it’s not a toy. Honest. More to come soon, grud willing. Good to see another M109 build Sean. You have progressed farther than I did. OK, here's my kit, the upgraded M109, a.k.a the Paladin. Another economical and a little aged kit from Italeri. Opening the box, there's a load of contents... some of which I won't need hopefully. 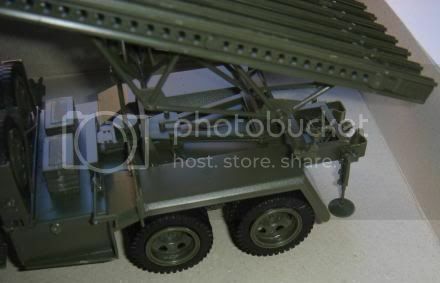 Knowing Italeri kits contain vinyl tracks, I already have purchased AFV Club's M109 tracks labeled T136. I do not really know if they can be used for the Paladin as well, but I don't want to use the kit tracks. Also after testing the huge barrel, I decided a metal barrel would be a good replacement, saving me a lot of sanding and correction work. 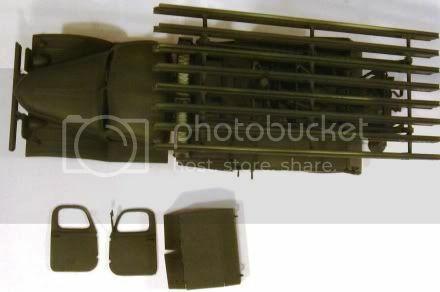 I ordered Barrel Depot's Paladin barrel (35013 I think) and currently waiting for it to arrive. The lower body went together without much fuss. A local modeller warned me about possible warping problems in the kit. There were none so far. Then I attached the suspension arms. After everthing was assembled and dried out, I proceeded to put the top part of the body. Here's the surprise. The entire upper hull is warped into a V shape, the worst of the problem being located on the right end. I tried forcing the part into shape, no use. I decided to force the part onto the lower body. I started from the front, using Revell's cement and then applying lots of Tamiya's Thin Cement onto the connections and holding them together.... It took nearly 45 minutes, working inch by inch, but everything is holding together. My only problem is here... It should be easy to fill up. Today, if there's nothing else, I will start assembling the road wheels and possibly AFV Club tracks. Let's see how those turn out. Unexpected problems, but after my last three kits (a Revell, an old dog Dragon and an Alanger) these are nothing. At least Italeri's plastic is nice and easy to work with. wow, great to see so much progress already! I need to get in gear I guess. I'll be finishing up a couple other builds before getting to this one though. well how time sneaks up on you. i havent even started my stryker for that gb and now this one starts. 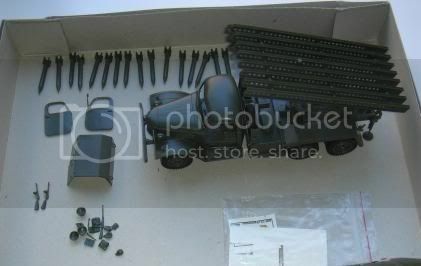 but i do have my kit its the testors sp m108 105mm howitzer. i have built this many moons ago so it shouldnt be that hard of a build., the thing is i have at least 3 gb on the fine scale modeling site that i am in. one is stalled and about 60% done and one is about 50% done and one not even started but that is an m577 and that will be done in no time. so i should start on it by the end of the month i hope if all goes well. Thank you very much for your help, Mark! Well, this seems to be a parade of old Italeri kits so far. Emre, good job on fixing that difficult fit. The rockets are assembled and painted. Not a great fit, but I think they will look alright in a diorama. Well darn it, I totally forgot this one started now. No bother, the progress on my other armor build is moving along nicely and I should have that one wrapped up in a couple of weeks. Then I can start on Karl. Hi I'm hoping to build The US version of the Katushia. Have only a couple of pictures to work from so its going to be a lot of guess work. Im using the later relase that Italeri have done with the hard cab instead of the soft cab. This is hope fully what i'll end up with. Have build the truck cargo bed ready to work out the launching ramp frame. 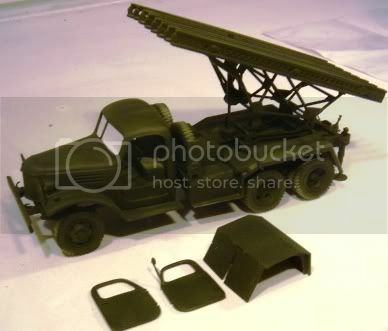 Good work Jesper, I might even have to repurchase that Katyusha or the Zis 151 truck at least. You work real fast! US rocket launcher on a truck? First time I see that, I knew about the Sherman one but this is very new. I have made progress with my build and I am nearly done with the lower body. The turret needs my metal barrel before its assembly, so until then I might be on hold, it will take about 2 weeks for my order to arrive. I really liked the Italeri M-109, despite its obvious problems. After this I might build a regular M-109 as a Turkish Army vehicle, who knows? Pics of my build will follow shortly. This is yesterday's progress. As of now, I will put this build on hold and concentrate on other builds that are nearly complete. I had already completed assembling the hull with some fit issues. I moved onto the wheels. To my surprise, the wheels were clean of any seams and went together really easily. While they were drying, I moved onto the hull to cover some areas with putty and/or plastic pieces. The hole in the front was covered by tucking in some plastic strips (as putty tends to lose form in these places and caves in). Then I carefully applied putty to the rear right end. I applied putty, then gave it a good sanding. No more problems! Then I began assembling the rear parts. First to go on are the movable shock absorbers(or else, what do you call them, they prevent the vehicle from bucking and moving when it fires). Some seams to clean up, some pinmarks, nothing really serious. However, take care while assembling. OK, here's where I went mad. The exhaust. Italeri gave it without any holes, I was confused at first. Checking to see if it was really the exhaust, I attacked it with my pinwise. It took me ten minutes to drill that properly. Bah! With the last pieces to be assembled, the rear is also done. The hull assembly, except for the gun cradle, is done. This is it for now. I assume I will have my metal barrel next week, however since I might be leaving town and I have other projects, my SPIF work will possibly be on hold till September. great looking builds so far escipally the m109. looks like i have its cousin the m108 that i am doing for this gb. how much did those afv club tracks cost? I will try to assemble an Areoplast BM-8-24 or an Italeri M109 A6 Paladine, which ever gives me the least amount of trouble. I see that Emre has started a good looking M109. I'll stick to the Brummbar as planned ... that'll just be too much OD. Hi Robert! I bought it from Luckymodel, it was 10 USD + shipping, I paid about 12 USD. As for the other Robert, the Italeri kit requires a little bit of work to make things proper, but after some horrid kits (Revell, Alanger, you name it) I liked it a lot. At least the plastic is good quality and easy to work with. There's a little issue of punch marks, but nothing serious.